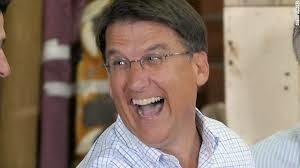 "I'm an Eisenhower Republican," McCrory told a crowd at open-mike night in a Washington comedy club, and the line killed. Several people spilled their top-shelf drinks guffawing. Well, okay, it wasn't a comedy club, but it might as well have been. It was the Jim DeMint(ed) Heritage Foundation, still all puffed up with self-importance for having pushed Congressional Republicans into shutting down the government over the threat that somewhere a poor person was about to get health insurance. The Heritage Foundation would string up Eisenhower these days, but apparently they let Governor Squishy get away with that bland fabrication. For some reason, the demented Heritagers want to embrace McCrory as much as he wants to embrace them, since he allowed the most right-wing state legislature in the country to romp all over the progressive history of the state, with his blessing, while he baked cookies and grinned like an idiot. McCrory's Washington comedy gig does clarify just exactly where he wants to stand, waaay over to the Right, and for that (as Tosh would say), we thank him.